Those of you who read my blog faithfully (bless you!) know that I came late to the Peter Lovesey Party, but I am a convert after having read his latest two Peter Diamond mysteries. Lovesey was continuously recommended to me, but-- as you fellow voracious readers understand-- it's impossible to read all the books you want to read. Even if you had nothing in the world to do but read, there's still not enough hours in the day. But I can't resist a well-crafted British police procedural, and after savoring Cop to Corpse and The Tooth Tattoo it's no surprise to me that this award-winning author is so well-respected. When I read that Peter Lovesey was going to appear at The Poisoned Pen, I marked the date in my planner so I wouldn't miss it. 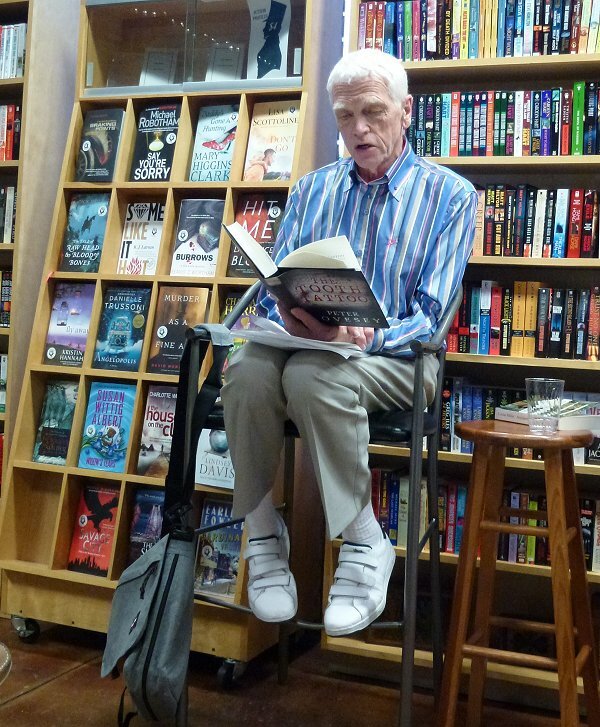 Before diving into his Peter Diamond novels, Lovesey spoke a bit about the standalone books he's written (The Reaper is his favorite), and why he likes to write them. "Once a series is underway you feel as though you're on a treadmill, so it's nice to break away." On a tour a few years ago, Lovesey had a stop in Salt Lake City where he was practically accosted by a woman in a big hat. "I was told to read your book," she said rather accusingly. "I didn't understand it." Lovesey calmly looked at her and made a suggestion: "Read it again." When asked if he went through a lengthy period of revision when writing his novels, Lovesey said no. "I'm not a revisionist," he stated. "I'm a perfectionist. I can't finish a sentence or a paragraph or a chapter and move on to the next until it's right. What I've written is basically what goes to the publisher." Led by the always capable Barbara Peters, Lovesey then went on to talk a bit about his beloved detective. Lovesey chose the name because the character is a diamond in the rough. He can be a bully with his staff and likes to call the forensics experts "the men in white coats." And-- like all writers with their main characters-- there are elements of Lovesey in Peter Diamond, in particular Lovesey's enthusiasm for old black and white movies and the fact that they're both "a bit of a dinosaur." "How could you kill off Steff? I was horrified! Now what will Peter do? I almost went into mourning. I had a major operation three weeks ago, and being in a weakened state and of an advanced age, I found myself with plenty of time to read...."
Lovesey looked up with a twinkle in his eye. "She really knew how to stick in the knife and twist it," he said. That one letter shows how very much fans come to love the characters that writers create-- and how strongly they can protest when they don't like something. Lovesey began talking more in depth about his latest novel, The Tooth Tattoo... the book his son Phil doesn't want to read because "he has trouble with the dentist." Before he could go any further, Barbara Peters had the first three minutes of a Beethoven string quartet played, since it figures so prominently in the book. "I wasn't expecting musical accompaniment," he quipped. 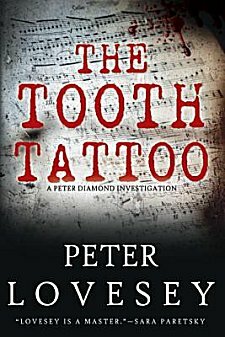 For a long time, Lovesey thought The Tooth Tattoo would be a short story. In 1994, he read an article in The Guardian called "Four's a Crowd" which asked the question "How do four people play together, stay together, year in and year out, and not kill each other?" The article then went on to talk about three members of a string quartet who forced the fourth member out. The ousted violinist sued the other three and won $611,000. Forced by law to pay, this bankrupted the other three, who had to sell everything they owned-- including their instruments. Lovesey sat there and thought, "If that's not a motive for murder, what is?" Thus in 1994 the tiny seed of a story was planted in this talented man's mind, where it germinated for almost twenty years before becoming the splendid novel The Tooth Tattoo. We were also treated to Lovesey reading pages from the book and the insider info that the next Peter Diamond book is already in the pipeline. Its title? The Stone Wife. Another great event at my favorite bookstore! I know that most of you aren't as fortunate as I am to have The Poisoned Pen so close by. Many of their author signings are available through webcasts. You can also keep "in the know" by following The Poisoned Pen on Twitter, Pinterest, and Facebook! The words which drew me in was the British bit! I am so glad that the books are available in the Melbourne library where I am headed to this week so looking forward to this addition to shelves. Oh, good-- I'm so glad you're going to read his book! Well, it looks like I'll have to get on board. I haven't read Lovesey. How great that you could attend this event -- I love the fan letter and his reaction to it. I loved the fan letter, too! Another fantastic recap of what sounds like a fantastic event. I liked the story about the fan letter. She really let him have it, didn't she? 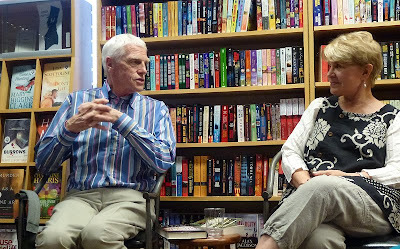 I'm always jealous of your proximity to The Poisoned Pen but I recently noticed a bookstore in Binghamton has begun having author events. I'm watching for an appearance by an author I'm interested in. I hope one shows up soon, Barbara! Thoroughly enjoyed reading about Peter Lovesey's visit to The Poisoned Pen. I've read several of his, including The Reaper, but not any of his Peter Diamond books. Oddly enough I came home with Cop to Corpse from the library today. Hopefully it won't matter that I haven't read any of the previous books in this series.